Synonyms: Canarium baccarai, Canarium multifidum. Dabai is a fruit from South East Asia. Botanists believe it to be a native a native of Borneo. Its trees can be seen growing wild in very large numbers in Brunei. 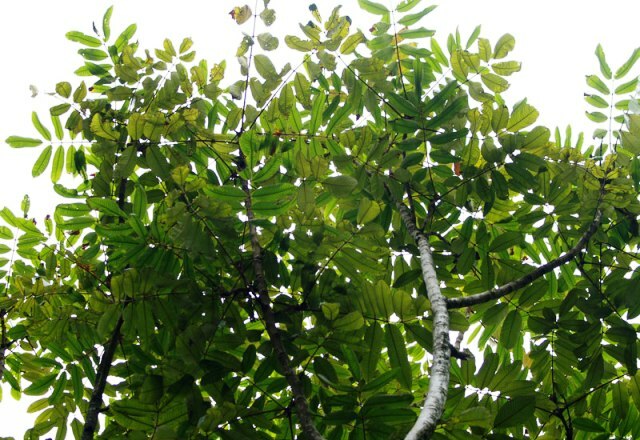 Dabai trees are also found in Sibu, Kapit and Sarikei divisions of Sarawak. Dabai is both fruit and nut. As the outer mesocarp forms the edible pulp. The seed kernels are also edible. Dabai is a very popular fruit with local people. It is consumed in large quantities by local people. A large evergreen monoecious tree upto 60 m high. Leaves 3-8 jugate, leaflets oblong to lanceolate, 15 to 40 x 5 to 10 cm, coriaceous, sparsely pilose to densely tomentose beneath and on the midrib above; base subequilateral, broadly cuneate to subcordate; margin dentate to serrate,: apex abruptly short and slender, acute acuminate,; nervation slightly sunken above, strongly prominent beneath; nerves 15-28 pairs, straight to faintly curved, gradually curving, towards the margin, rarely distinctly arching; intermediate veins often strongly developed. Inflorescences axillary, together pseudoterminal(sometimes truly terminal), laxly paniculate, densely tomentose, male one 30-50 cm long, many flowered, female ones 15-20 cm long and with few flowers. Fruits round to ellipsoid, rounded triangular in cross section, 2.5 to 3.5 by 1.75 to 2 cm, glabrous, pyrene smooth, faintly 3 lobed, lids 0.5 – 2.5 mm trick, bony. Seed 1, sterile cells more of less reduced. The fruits are edible. However, these cannot be eaten like other fruits as these turn hard at maturity. So these are soaked in water for about ten minutes and then eaten. They taste like avocados. So these are eaten with sugar or with salt and soy sauce. The white compressed kernels in the seed are also eaten. They are crunchy with fine flavor and rich mealy oily taste resembling taste of groundnuts. Several products (mayonnaise, sauces, chips, pickles and soap) have also been developed from this fruit for local markets. 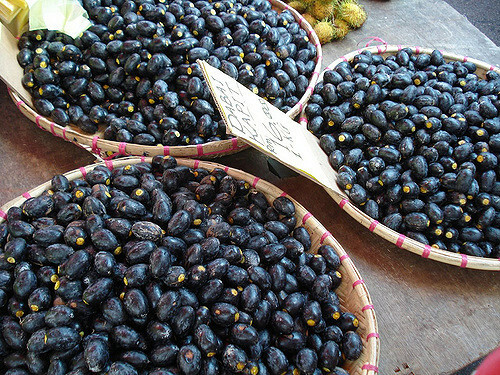 This fruit is also used by local restaurants as ingredient in their dishes. Dabai is a very nutritive fruit. 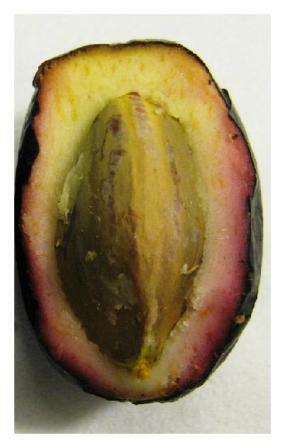 Lipid is the major macronutrient of this fruit, while the predominant minerals were magnesium and calcium. Dabai fruit are a good source of unsaturated fatty acids, with 38-44% oleic acid, 12-14% linoleic acid and trace of linolenic acid. The total anthocyanin content in dabai fruit (2.05-2.49 mg anthocyanin/g dried weight) is comparable to that of blackberry, blueberry and grape. Sixteen types of phenolic compounds from phenolic acids to the various subclasses of flavonoids have been identified in dabai fruit. 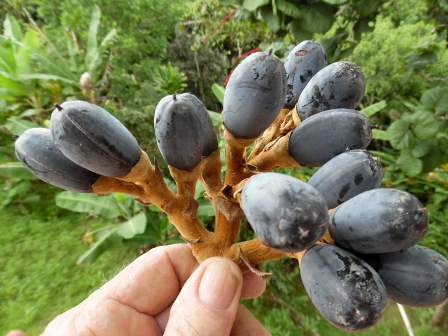 Dabai fruits are still collected from wild in spite of its popularity and importance in local diet. It has not been brought under cultivation yet though there exists a scope for its domestication. One finds its trees only as specimen plants in the collection of botanical and other similar gardens. 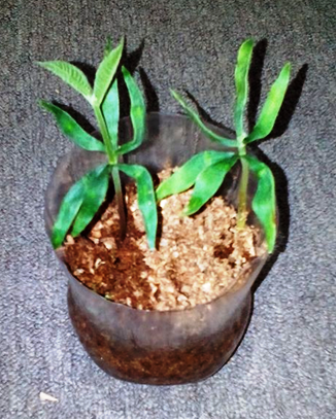 New trees can be raised from seed which are slow to germinate.